A slideshow of some of the great systems that were at this year’s Munich High End. We don’t often review singles here at Hifi Pig but this one is for a good cause and so it’s going in the news section too to give it maximum exposure. When listening to Mono records on a Stereo set up, you may notice a lot of, quite annoying at times, background/surface noise that is more noticeable when listening to Mono. 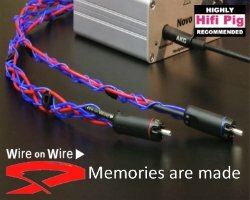 “Unless you have a mono button on your amp/pre amp you need an Ecosse Tru-Mono Interconnect in order to sum that surface noise to the centre of your speakers, to where the music is, ensure a significant reduction in that surface noise” says the press release for this unusual cable arrangement. Ostensibly it’s a solution requiring one female to male and one male to female cable combined in one interconnect thus ensuring a true Mono summation of the two stereo channels into one. This will lower noise, distortion and generally make the records sound better in every way. Mono information is all lateral. Stereo cartridge read the vertical component of the groove information. On a mono record that would all be rumble and noise produced by imperfect pressing, which is the reality of vinyl playback no matter how well the record is pressed. 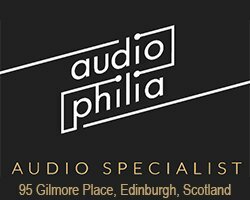 In the top line Ultra Reference version Ecosse use their proprietary Monocrystal™ Copper MACH2XS RCA plugs together with DH Labs ultra gold-plated pure copper sockets. 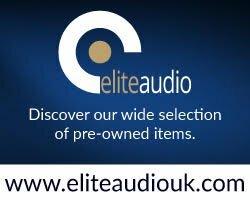 In the Audiophile version they use their proprietary Monocrystal™ Copper MACH2XS RCA plugs together with Neutrik gold plated sockets. All you need do is connect the Ecosse Tru-Mono Vinyl Interconnect between phonostage and pre/power amp or between turntable and pre amp, and away you go. Bryston has announced the introduction of a proprietary Integrated Audio Device (IAD) for the BDP-2 Music Player. The new IAD delivers improved specifications and replaces the current two- piece third-party sound card and SPDIF interface module (AES/BNC) utilised in the BDP-2. All new BDP-2 players are currently shipping with the new IAD installed, and legacy BDP-2 consumers have an option to retrofit to the new device for an MSRP of $500. IAD upgrades will be managed at the Bryston factory until dealers and international distributors have been trained to properly install the new module. “There were several important factors that led us to develop the IAD,” reported Bryston VP James Tanner. “We were confident that by eliminating three connection points, hand selecting and testing all of the components and shifting to our meticulous in-house manufacturing that we could improve transient capability while enhancing low resolution detail,” Tanner added. The Bryston IAD is also directly powered by the BDP-2’s premium quality linear power supply rather than by a power source shared with the motherboard. Japan’s DS Audio, who in 2013 created the world’s first optical phono cartridge exclusively for the Japanese market, will soon be delivering its latest model to UK audiophiles, thanks to a new agreement with Berkshire-based distributor Sound Fowndations. Audiophiles of a certain age may recall a brief appearance of ‘the legendary optical cartridge’ in Japan back in the 1960s. Initially developed to great acclaim and lauded for its high fidelity, sadly this early attempt at an optical cartridge disappeared as quickly as it arrived. Having emerged ‘before its time’, the requisite precision mechanisms and sophisticated optics did not exist yet, making the optical cartridge too difficult to manufacture. In 2013, DS Audio used the latest state-of-art laser optical technology to introduce its first optical cartridge, the DS-001, which again was released only in its native Japan. The response was overwhelming in terms of both reviews and sales, spurring the company to further develop the design into the DS-W1, which is now moving towards worldwide distribution. 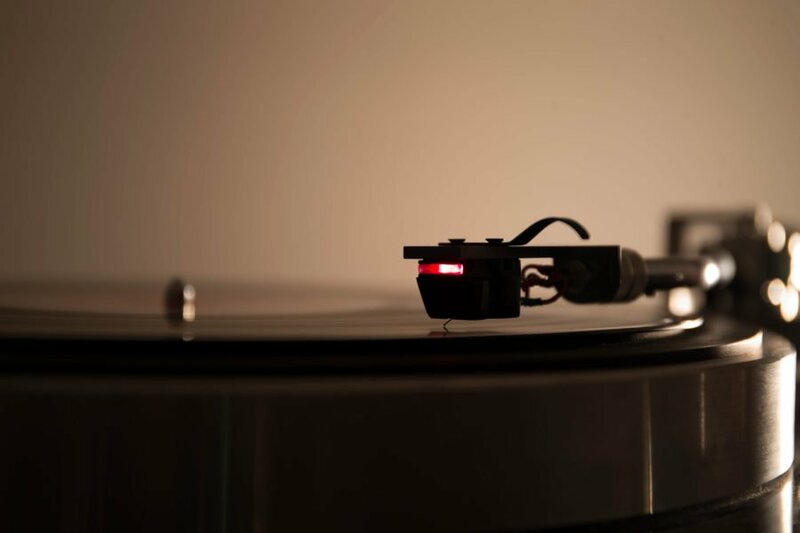 Unlike previous ‘non-contact’ systems which used lasers to read record grooves, DS Audio’s design is a pure analogue contact system that uses a conventional stylus and cantilever. However, in contrast to moving-magnet (MM) and moving-coil (MC) cartridges, which work on the principle of electromagnetic induction, the DS-W1 uses an optical system to convert stylus/cantilever movements into audio signals. The advantage of this system is that it completely eliminates the electromagnetic frictional force that is a ‘fact of life’ in all MM and MC designs. Faraday’s law of induction governs the design and operation of both MM and MC cartridges. As a result, both designs are subject to Lenz’s law. In audio terms, Lenz’s law states that the movement of the coil and/or magnet will produce a frictional force that affects the movement of the cantilever and hence the stylus, such that exact stylus vibration can never be reproduced by an MM or MC cartridge system. DS Audio’s optical system, on the other hand, has absolutely no effect on the vibration of the stylus/cantilever system. The DS-W1, which uses a boron cantilever and Shibata stylus, is housed in a machined aluminium body and weighs just 6.5 grams. This unique cartridge comes with its own special phono equalizer/power supply, so doesn’t require a phonostage, and can be installed on almost any tonearm. The first DS-W1 optical phono cartridge is expected to arrive in the UK in June, priced at £6,250 (inc. VAT), including dedicated phono equalizer/power supply. 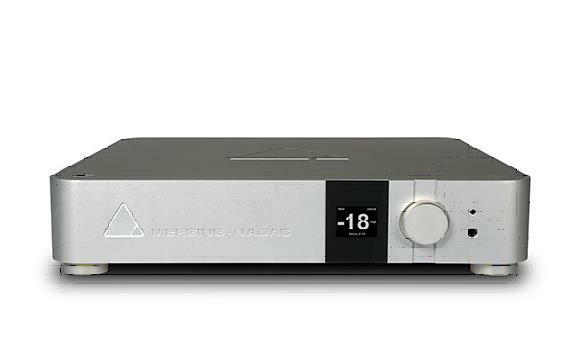 Fresh from a launch at the High End Show in Munich, Merging’s audiophile D/A converter, NADAC, will be on show in the Boardroom/Thinktank and in Room 441 at T.H.E Show, Newport from 29-31 May. Merging’s NADAC product manager, Dominique Brulhart will also participate in “DSD and Analog: The Great Convergence” on Saturday 30th May at 4.00pm. The venue is Salon A in the Grand Ballroom, The Hotel Irvine. 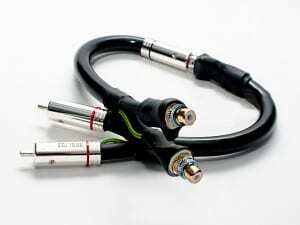 NADAC stands for Network Attached DAC, and will be delivered in two different versions, stereo and 8-channels. Both variants have ¼” and mini-jack headphone outputs and the monitoring-grade headphone outputs can be configured to carry a different signal to the main output. Merging Technologies was encouraged to produce NADAC because of the praise their professional D/A converters have received from leading recording engineers. It uses the same technology and is built to the same standards. Many of those recording companies are in the forefront of providing a large catalogue of true Hi-Res Audio downloads. 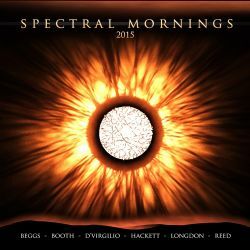 These are typically in DSD or DXD and many of them will feature the multichannel DSD files previously used for SACD releases. Merging is forming a dynamic partnership with a growing number of these content providers, to jointly promote the benefits of the listening to the music as the artists intended. Special deals for NADAC purchasers will be announced as they are made available. NADAC covers PCM formats up to 24-bit/384kHz and DSD up to DSD256. It has AES/EBU and SPDIF digital inputs for use with CD players, CD transports or other devices up to 192kHz. An Ethernet interface is provided for use with computer based digital audio systems for carrying through ASIO on Windows and CoreAudio with DoP on MacOS any resolution up to 384kHz, DXD and DSD256. This uses the RAVENNA protocol that Merging Technologies helped to develop for high sampling rate applications and allows very robust and accurate transfer of the digital audio data from the computer to NADAC. The data is stored in a large buffer memory in the NADAC and then clocked out by the unit’s precision internal clock. This and the RAVENNA protocol’s ultra-stable Precision Time Protocol (IEEE 1588) eliminates the cable and jitter related problems associated with conventional digital audio interfaces. The NADAC’s line outputs are driven by an ESS9008S SABRE Reference Audio D/A IC. This IC has 8 separate D/A converters and in the stereo version of the NADAC, each channel uses 4 D/A converters with the outputs summed in order to provide improved linearity, greater dynamic range and a lower noise floor. The 8-channel version of the NADAC may also be switched to work as a stereo unit, with the converters configured in the same way. Careful circuit layout and component selection, refined by many hours of listening tests has enabled the highest level of performance from this configuration. This is backed up by results that the test gear can barely measure. The headphone output uses the same type of converter IC configured similarly. The NADAC has balanced and unbalanced line outputs; two headphone outputs; a digital volume control and any smart device with a web browser can serve as a remote control. 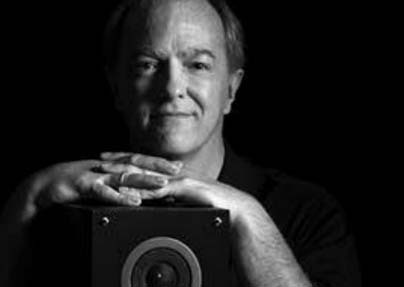 Internationally known speaker designer Andrew Jones joins ELAC to create the ELAC DebutTM speaker series. The introduction coincides with ELAC’s return to North America with an exhibit T.H.E. 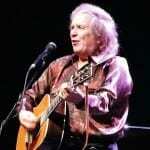 Show in Irvine, Calif., May 29-31, 2015. 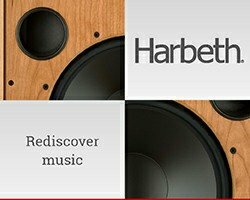 “ELAC is pleased to bring Andrew Jones on board, as the company expands into global market with products that establish benchmarks for performance and quality at every price point and in every category of the customer audio market”, says Gunter Kürten, managing director of the 89-year old company. Designed in Cypress California, ELAC’s DebutTM series “redefines affordable speakers with eight models, including two bookshelf, floorstanding, center-channel and Dolby Atmos©–enabled speakers, complemented by three subwoofers”. “My design objective was to achieve the most accurate sound possible in speakers that deliver performance far exceeding their cost”, says Jones. “I’ve employed materials and design specifications not found in speakers in this price range. From cone materials to driver geometry to subwoofer amplification, we built serious value into the Debut series”, Jones said. Industry veteran Andre Jones’ 35-year career includes a portfolio of award winning loudspeakers. Jones previous positions include Chief Speaker Engineer at Pioneer Electronics, Technical Audio Devices (TAD), KEF and Infinity. 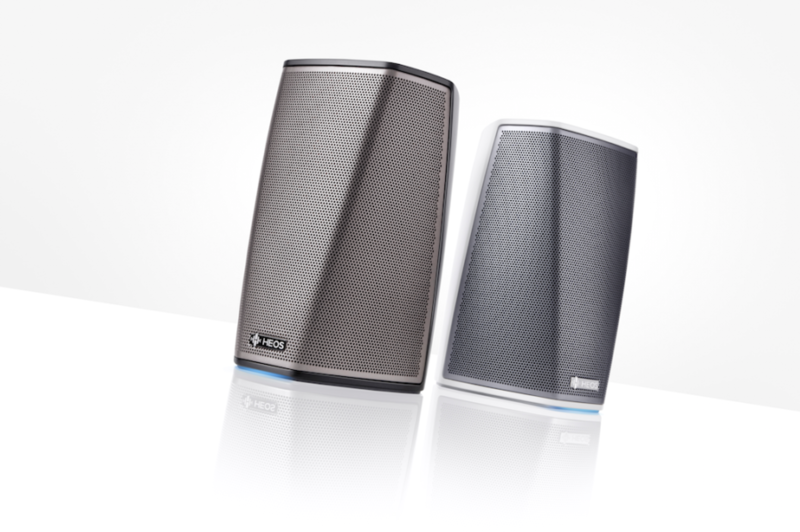 Denon® has unveiled its HEOS 1 and HEOS 1 Go Pack, the latest additions to the HEOS wireless multi-room music system. The portable HEOS 1 wireless speaker is the first product in the series intended for both indoor and outdoor use. The HEOS 1 Go Pack extends the usability and features of the HEOS 1 for consumers who want to take their music anywhere. These latest additions to the Denon HEOS series will be available in June. The £199 HEOS 1 packs all the best features of the HEOS series into a diminuitive yet powerful package. With the easy to use free HEOS app, set-up means great sound within minutes for indoors or outdoors. And with the Go Pack, HEOS 1 expands into a fully wireless speaker that takes multi-room listening outdoors. The £79 HEOS 1 Go Pack is an accessory pack consisting of a rechargeable battery, a Splashguard, and a Bluetooth®-USB adapter. The HEOS 1 can provide up to 6 hours of music and entertainment, with the Go Pack’s rechargeable battery. The HEOS 1 speaker itself is humidity resistant, yet with the addition of the Splashguard it becomes splashproof for added protection at outdoor events that may occur in the rain or poolside. And for those who enjoy Bluetooth capability, the Go Pack’s Bluetooth-USB adapter allows the user to stream Bluetooth audio directly to one HEOS 1 speaker. In addition, when Wi-Fi is available, the Bluetooth audio can be shared with other HEOS devices. 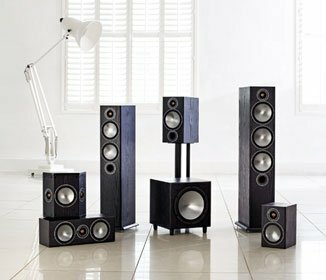 Monitor Audio has announced the availability of its latest Bronze speaker range. It moves up a gear from its award-winning BX predecessor by integrating a new generation of C-CAM® drivers with high quality cabinets in four vinyl finishes: Black Oak, Walnut, Rose and a new White Ash. Invisible driver fixings and floating magnetic grilles add to the impression of streamlined sophistication, lending New Bronze the look and feel of a premium range. OPPO Digital has announce the integration of the TIDAL streaming service into its range of Blu-ray players. After a simple firmware update, users can sign into the service via the latest OPPO MediaControl app and browse the library of over 25 million songs streaming at CD quality. Available shortly for download from the OPPO website, the latest update is easily installed at home via the internet or by using a USB stick loaded with the firmware. NAD Electronics has unveiled the latest edition to its VISO headphone range – the on-ear VISO HP30. Featuring NAD’s RoomFeel™ technology, which combines “unprecedented sound accuracy with the aural spaciousness normally associated with listening to a pair of high-quality loudspeakers in a great listening room”. 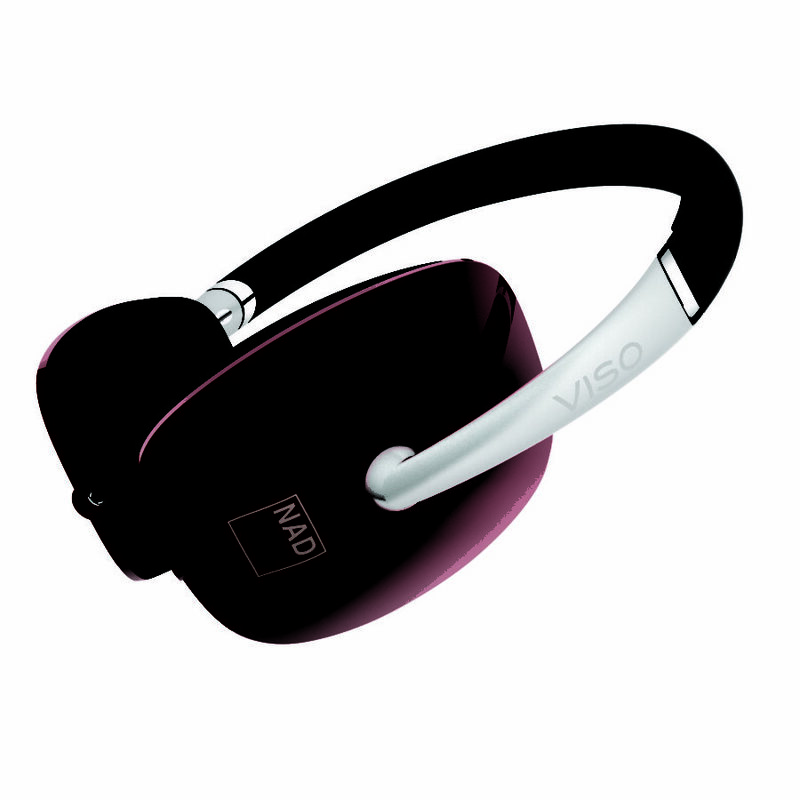 The VISO HP30 on-ear, closed-back design includes an internally damped acoustic chamber and Ultra-low mass, high excursion 40mm drivers featuring neodymium magnets. The ear cups are attached to the aluminium headband, and soft foam ear pads perfectly conform to the ear for a nice seal to isolate sound and provide long-term comfort. When not in use, the VISO HP30’s clever folding system and included custom-designed carry case make them easy to stow away. RoomFeel involves calibrating the chamber design on both sides of the driver and adjusting the corresponding target response curve, which can be ‘tuned’ to get the desired response. Getting the correct ‘transfer function’ ensures accurate sound reproduction with natural aural spaciousness and balance as if listening to a pair of high-quality loudspeakers in a room. In addition, every VISO HP30 driver is individually calibrated, then matched as pairs within an extremely tight tolerance to the reference response. Available in three high gloss colours, Black, Red, or White, the NAD VISO HP30 comes with its own neoprene travel case, two detachable tangle-free cords – one standard and one Made for iPhone in-line remote control and microphone – and ¼” stereo and airplane adaptors. Gramofon makes it easy to stream music over the cloud to any audio system you own, from portables to hi-fi separates. Plug the little black box into your system via the supplied stereo RCA cable, connect it to the Wi-Fi network in your home (a simple process that takes a matter of minutes) and get streaming from any Wi-Fi-enabled device – smartphone, tablet, PC or Mac. Gramofon is made by Fon: creator of the world’s largest Wi-Fi network, with more than 14 million hotspots – we were early adopters of FON and so very interested in this new doodad. The device was first revealed in 2014 as a Kickstarter project, subsequently launching as a companion to the Spotify Premium music streaming service. Fon’s Wi-Fi know-how and the integration of Spotify Connect enabled the creation of a simple and affordable audio streaming device, ideal for Spotify users wanting to stream music to their existing audio systems with minimal fuss and expense. 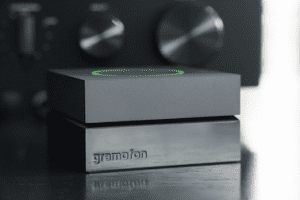 Now, Gramofon is evolving. A major software update has brought Qualcomm’s AllPlay platform to the party, opening up a raft of additional services and facilities. In addition to Spotify Premium, Gramofon now supports all the other music-streaming services on the AllPlay platform, including Napster, Rhapsody, TuneIn, Aupeo, doubleTwist and Soma FM. 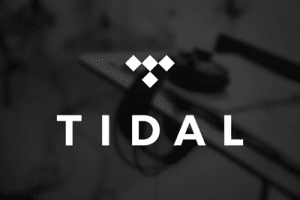 More services will be added to AllPlay over time, and each will be compatible with the Gramofon – the likes of Tidal, SoundCloud and iHeart Radio are all coming soon. AllPlay isn’t just about streaming music via cloud-based services; it enables you to play music stored locally on your smartphone, tablet or computer, too. It also adds nifty multi-room functionality – if you have several audio systems around your home, simply connect a Gramofon to each one, and add them to your Wi-Fi network. Via the AllPlay app, you can choose to play music in just one room, or different music in several rooms, or synchronise your Gramofons so they all play the same thing. Fon is now rolling out updates to incorporate AllPlay; every existing internet-connected Gramofon will have its firmware upgraded automatically and future Gramofon shipments will have AllPlay pre-installed. Gramofon is a true ‘fit and forget’ product – once connected to your Wi-Fi network, all updates are automatic. Gramofon offers one further unique bonus: in addition to its music streaming capabilities, it also serves as a Wi-Fi extender, all for just €59 (around £43 at the current rate of exchange) with free shipping. The Chord Company has launched what they are saying is its most advanced mains product to date: Sarum Super ARAY power cable. The new Sarum Super ARAY is the Wiltshire company’s flagship power cable and forms part of a new reference-level range first unveiled at Sound and Vision 2015, in February. The Sarum Super ARAY power cable conductor geometry was developed just as Chord started to work on a new UK mains plug and IEC plug. The mains plug is a bespoke version of an MS Power mains plug — the conductors have been heavily silver-plated and changes have been made to the internal structure of the plug casing. The changes act to both stiffen the casing and to allow the fitting of two silicone tubes, which are designed to improve mechanical damping and vibration. The new IEC plug is also a bespoke Chord Company design. The internal contacts are heavy- gauge and again, are heavily silver-plated. The conductors remain the same as the original Sarum and then the Sarum Tuned ARAY power cable: micro-polished and silver-plated. The insulation is gas-foamed PTFE and the shielding is a high-density silver-plated braid, combined with a heavy-gauge shield. The key difference, though, apart from the new mains and IEC plug, is the way that the new Super ARAY conductors are utilised. This involves the fitting of an ARAY ‘chamber’ and extensive internal re-working. The strongest visual clues, though, are indeed the new plugs. The Sarum Super ARAY power cable is available in 1m, 1.5m and 2m lengths from stock. Custom lengths can be made to order and The Chord Company can also terminate with Furutech 16 amp IEC connectors. 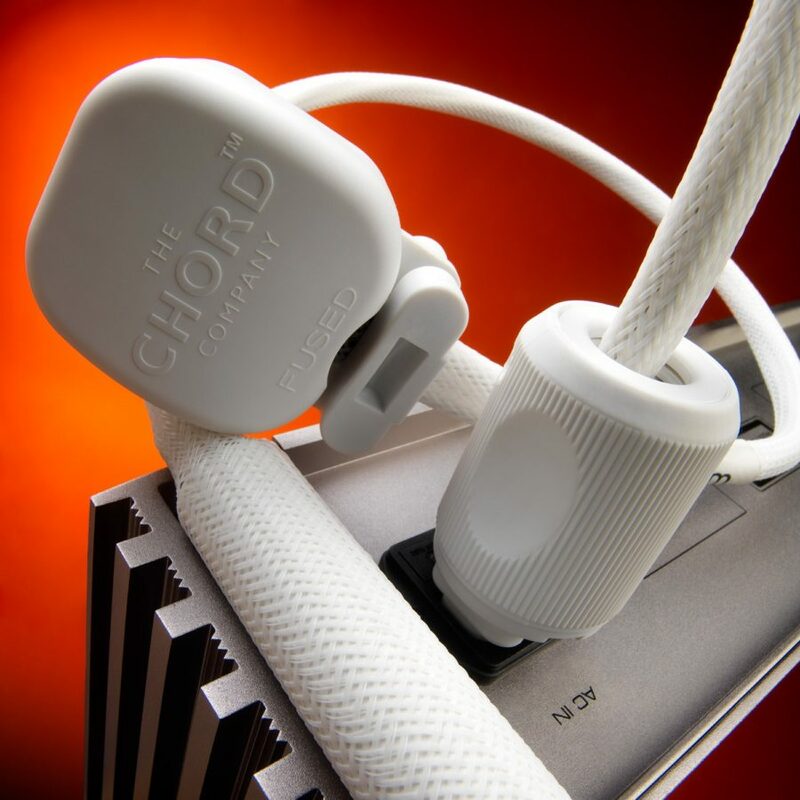 Where space is restricted, Chord can also fit-to-order the high-quality Schurter IEC plug that has been used for many years on its Power Chord. European Sarum Super ARAY power cables are also available: these are fitted with Furutech Schuko mains plugs..
Price is £1700 for 1m.